In autumn 2004, the crop of berries, especially of Rowan Sorbus aucuparia failed in Fenno-Scandia owing to very wet weather that caused the fruit to rot on the trees. After the birds turned from their breeding season diet, mainly insects caught by flycatching, they rapidly found that they had to move south and west to find food. The Waxwings’ origins are shown by ringed birds from Finland, Sweden and Norway caught by ringers during that winter, but the numbers present in Britain, estimated at more than 100,000, suggest that some must have come from farther east in Russia as well. Their course through Britain was well-studied by a coordinated effort by many ringers. Birds were colour-ringed in north-east Scotland and subsequently seen farther south, including in Cheshire at Wilmslow and Warrington. In previous years with big Waxwing numbers in Britain, they have tended to move southwards along the eastern half of Britain (as noted by Coward (1900)), but in 2004/ 05 most of them moved along a more westerly track, thus favouring Cheshire more than ever before (Oddy 2005). It was not a straightforward movement, however, and individual birds proved to be highly mobile – birds ringed in Warrington were later caught in Sheffield – and careful watching of the main flocks showed a daily turnover in birds. 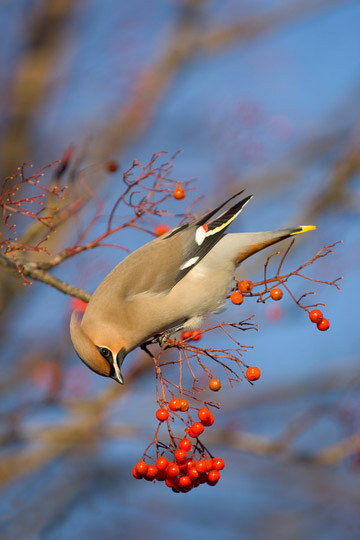 The first Waxwings were found in the county in late November 2004 and numbers built to a peak during January 2005. Three flocks totalled 690 birds on 19 January, but not all of the flocks were regularly counted and possibly as many as 2,000 birds were in our area at the peak. Numbers dwindled during February and some were still moving around Cheshire and Wirral in March and even into April, after the end of the Atlas winter recording season. This nomadic species showed its apparent preference for human sites, and almost all records were in habitats of F1 or F2 – urban or suburban areas. Several large flocks formed in the county, notably in the town centres of Macclesfield, Warrington and Runcorn, and at Chester Zoo. These often centred on just a few trees, usually ornamental varieties of Rowan, and led to amusing territorial battles with resident Mistle Thrushes, and occasionally with flocks of Redwings and Starlings. After exhausting the fruit there, birds spread out and wandered far and wide in search of more berries. Waxwings will eat almost any berry, of almost any colour or texture, and their agility, deriving in part from their flycatching days, and helped by their strong claws that allow them to grip well, meant that few berries were beyond their reach. They could be found widely throughout the county, although it needed an element of luck to spot where the birds had moved to, possibly only staying a few hours, and their distribution was probably under-recorded. 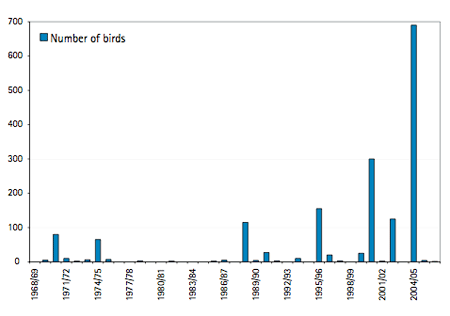 Also, amazing as it is to report, some birdwatchers tired of looking for Waxwings in 2004/ 05! Most birds were found by seeing the aerial manoeuvres of a flock of birds, perhaps initially confused with Starlings, and some observers detected Waxwings after they had gained familiarity with their call-notes, a pleasing twittering, likened by some to a mechanical sound such as a ‘Trimphone’, and perhaps sounding closer to a Redpoll than any other bird species. Some birds could be surprisingly invisible in the treetops, but they frequently showed themselves from their habit of feeding in bouts and flying off to rest in nearby trees and rooftops. They used the resting time to digest their meals and deposit the inevitable products - not always welcome in urban settings - although most members of the public were intrigued by the antics of the birds, and antics of the people who came to watch them. They were featured on television and radio, in local newspapers and websites. The extraordinary irruption of 2004/ 05 may represent a once-in-a-lifetime event for Cheshire and Wirral, and will long be remembered by birdwatchers as providing a marvellous start to our first ever winter Atlas. This influx was put into context by the next two winters, when there were only three records in 2005/ 06 and one in 2006/ 07, all from tetrads that had held birds in 2004/ 05.